This is the one dish,armed with which I entered my married life.Really..No Kidding! Tariwale Aloo Tamatar Sabzi was the only thing I knew how to make 8 years back..well that and Maggi..To this day, it’s what I love eating more than anything else in the world.It’s my comfort food, my got to for when I am missing home and mom! My mom made this all the time at home, on literally, every festival with hot pooris. So this year on Rakhi, I decided to go all out making this potato curry along with black Channa masala ,Kheer and obviously pooris.If you are on my Instagram you would have seen all the photos in my stories. I know I am never going to be able to describe it like it deserves and this dish deserves the words of poets not my left thumbed writing but still I will try. Now let’s talk about the curry- taste and texture.Depending on how you like it, you can make is watery or thick.It’s a tomato based curry which relies mainly on the starch from the boiled potatoes and the copious amount of tomatoes to thicken it up. Every ingredient added in this dish serves a specific purpose – The Methi Seeds and Coriander give the umami, the tomatoes give it a sour note, the red chillies and turmeric give it the characteristic colour and heat. Boiled potatoes are cooked in a roughly chopped tomatoes gravy along with a few choice spices.Usually, It’s the easiest to do this in a pressure cooker and that’s why this is also a very easy quick curry.In case, you don’t have a pressure cooker you can make the dish in a normal pot. Prepare the spices in advance.When the oil is add the spices- It can burn very easily, hence keep and eye and add the tomatoes if you see the masala starting to burn. Crush one potato with a ladle after the pressure cooker the sabzi. 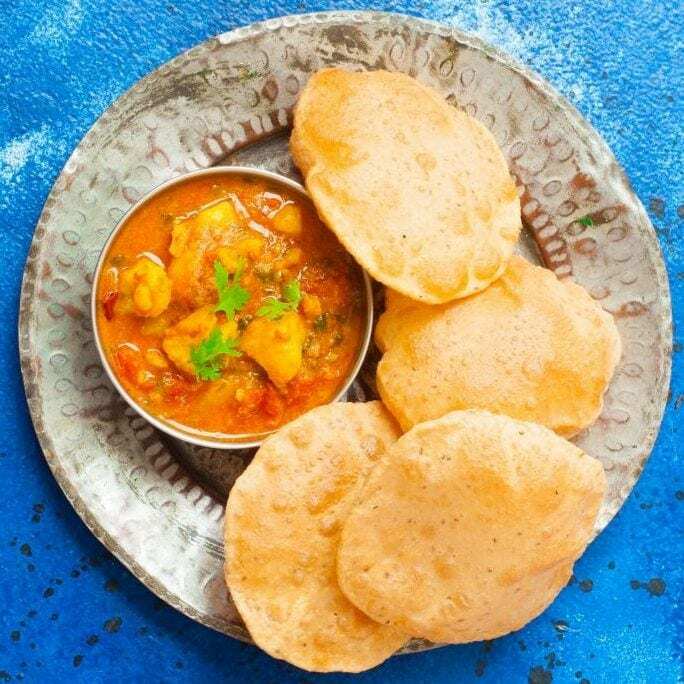 This is one dish that can be served with something as simple like rotis or plain rice and also with elaborate sides like- Pooris and Kachoris. In fact,Spicy Tari wale aloo with stuffed kachoris is one the most popular street food in delhi. Aloo Tamatar Sabzi is also made during the Navaratri festival in India, when hindus fast for 9 days – abstaining from Non veg food, Garlic and Onions.This curry is 100% Satvick. To make it during vrat replace the normal salt with Sendha Namak. Aloo Tamatar Sabzi - North indian Potato curry made in the pressure cooker,served with Pooris and Kachories during festivals and fasts. Once it is hot,add the Methi seeds and Jeera.Next, add in the asafoetida,Turmeric,chilli powder and Coriander powder.Mix it up with a Ladle and roast for about 20 seconds. Add the Chopped tomatoes along with their juices.Cook for 2 minutes. Add the potatoes, salt and water.Pressure cook for 1 whistle. Let the pressure release on its own. Test the salt.Add more if required. Garnish with coriander and serve with Pooris/Roti or rice.